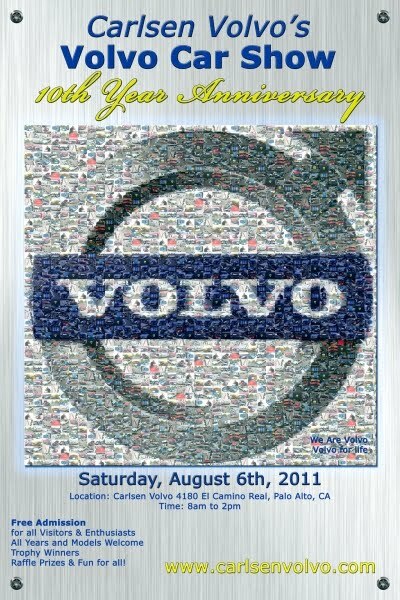 You are invited to join the us for the 10th Annual Carlsen Volvo Car Show on August 6th at 8:00A. Co-sponsored by: Volvo Cars of North America, Volvo Club of America Golden Gate Chapter, Interstate Batteries, KPAX Racing and IPD. Start your engines to catch the first west coast viewing of the brand new Volvo S60R! Shake hands with Guinness Book of World Records holder Irv Gordon “The 3Million-Mile-Man”and meet the ladies of Volvo sponsored Team TIBCO, the award winning #1 Cycling Team in North America! Make sure to check out the restored Baja Buggy (once owned by Bob Sinclair) and from Volvo Cars N.A. a fully restored 1956 P1900, see a Volvo Military Vehicle, and of course Volvo’s KPAX C30/S60 street versions. We have a full lineup of historic, unique and custom Volvos. Lunch will be provided by Carlsen Volvo.